"What I really need is a droid that understands the binary language of moisture vaporators." "Vaporators? Sir, my first job was programming binary loadlifters—very similar to your vaporators in most respects." Have you ever tried to pick up the language of moisture vaporators? To really learn the nuances of all those beeps and whistles to help you find gainful employment on Tatooine? Let us tell ya, it's not easy. We got "The Binary Language of Moisture Vaporators for Dummies" shipped to us from Ryloth, and even the most skilled linguists among us were baffled. C-3PO has no trouble talking with R2-D2, and we suspect he would have been able to do a fine job working with Uncle Lars on those vaporators had he been given the chance. So, as they say, fake it until you make it! Can't decode beeps and whistles? No matter! 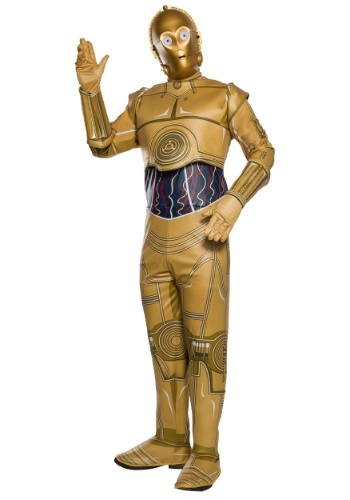 Just act like you can, by going in this Adult C-3PO costume. This officially licensed costume will give you the signature style of the famed protocol droid, and it will have you equally ready for both crash landing on a remote planet... or just attending your local Star Wars party in style. Featuring printed details of his signature style right down to the mid-torso wires, you'll look just like Threepio with it on. Just pop on the vinyl front mask, and you'll be ready for any adventure in the galaxy far, far away. The costume was great, the mask was slightly damaged during shipping.